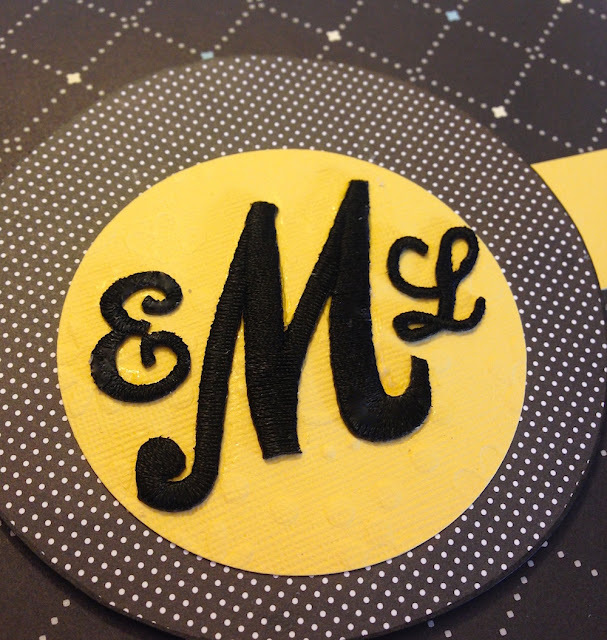 A set of handmade monogrammed notecards makes a lovely gift for anyone on your list. The soft texture of Joy embroidered letters is so elegant. 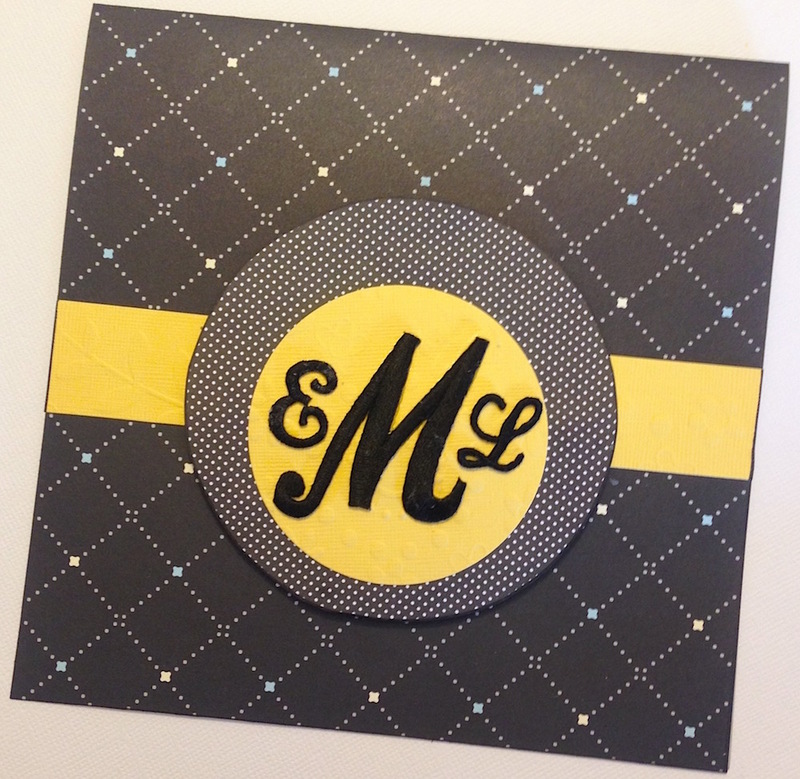 Monogrammed notecards are perfect for thank-you notes, dinner party invitations or even business correspondence. A simple card design like this is quick and easy to cut out and glue together, using your favorite colors of cardstock with coordinating scrapbook papers. 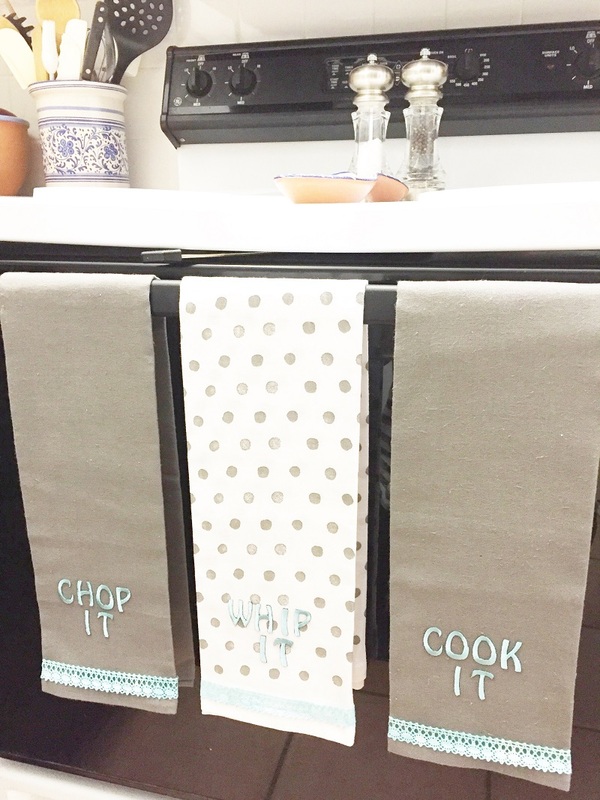 Here's my cute and quirky trio of kitschy kitchen towels that can be made in under 30 minutes with Joy embroidered iron-on letters! 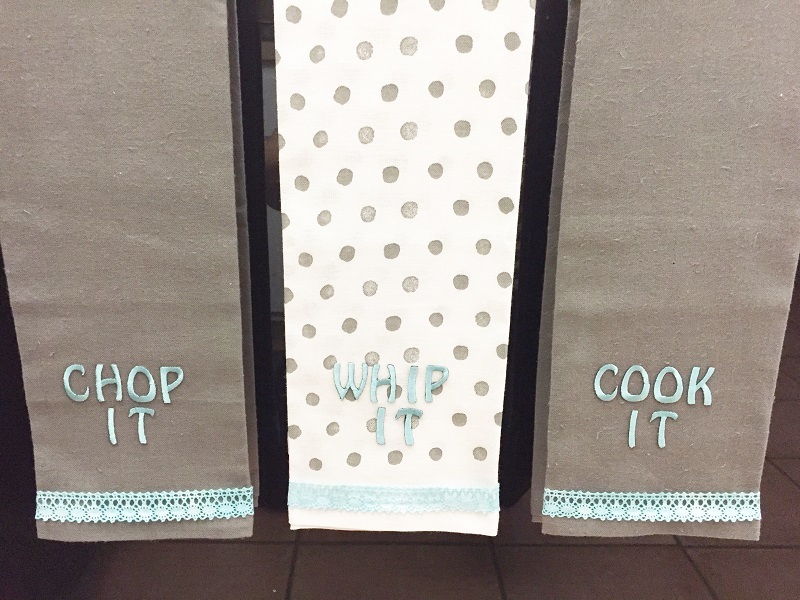 Select a set of floursack-style kitchen towels - I got mine at Target. Then select a color and style of Joy embroidered letters to coordinate. Place your sayings in the center at the bottom of each towel, approximately 2" up from the edge. Iron-on the letters according to package directions. 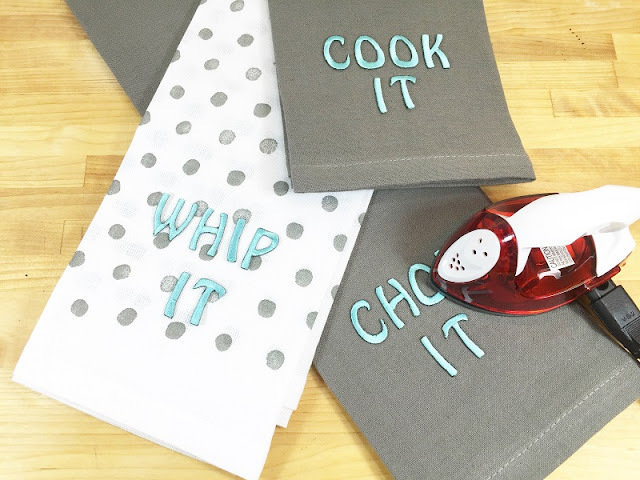 I always use a craft iron without holes to get the best adhesion. Attach a length of coordinating lace trim across the width of the towel on the hem line with fabric glue and let dry. All three towels were completed in less than 30 minutes! A set of these kitschy kitchen towels would make a great hostess, birthday or housewarming gift. Enjoy! 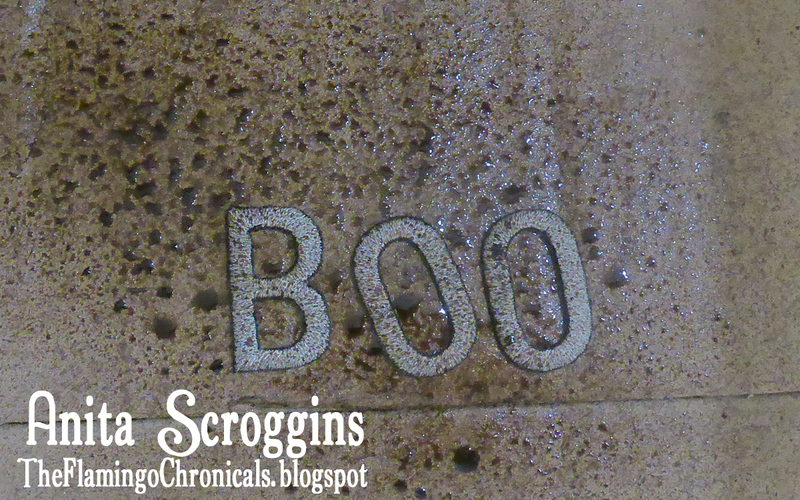 There once was a scarecrow name "Boo"
1. Peel the backing away from each letter then adhere to the front of your scarecrow. 2. 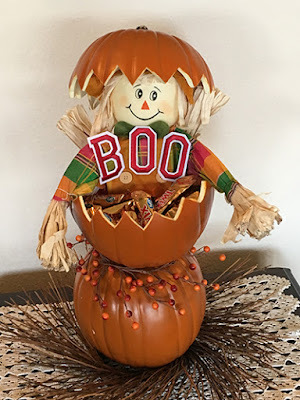 Using a zig zag pattern cut the top from the pumpkin then cut a hole at the center of the bottom half of the pumpkin to accommodate the pole. 3. 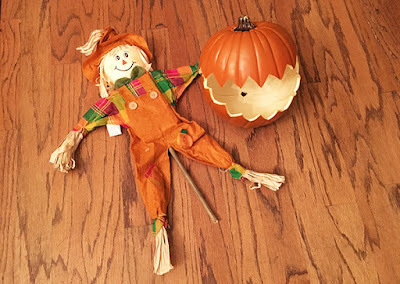 Place the scarecrow in the bottom half of the pumpkin, pushing the pole thru the hole. 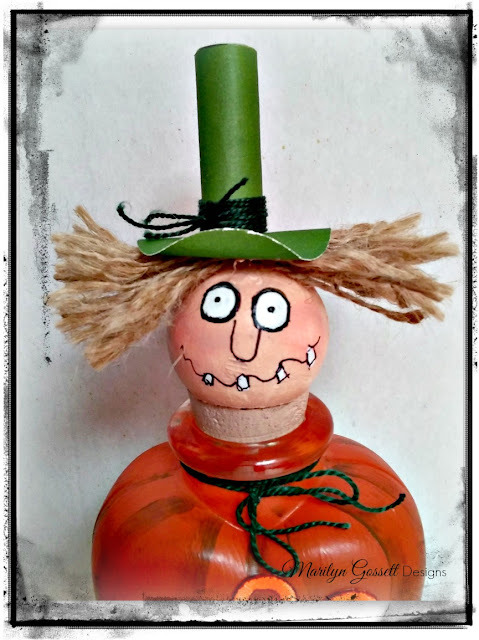 Glue the top of the pumpkin to the scarecrow's head. 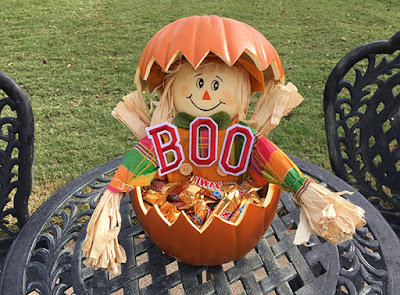 Fill the pumpkin bowl with candy. 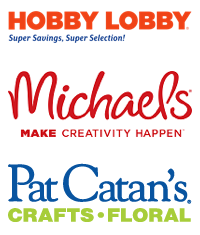 JOY™ iron-on letters can be found in a variety of colors, fonts and sizes at your local craft stores. 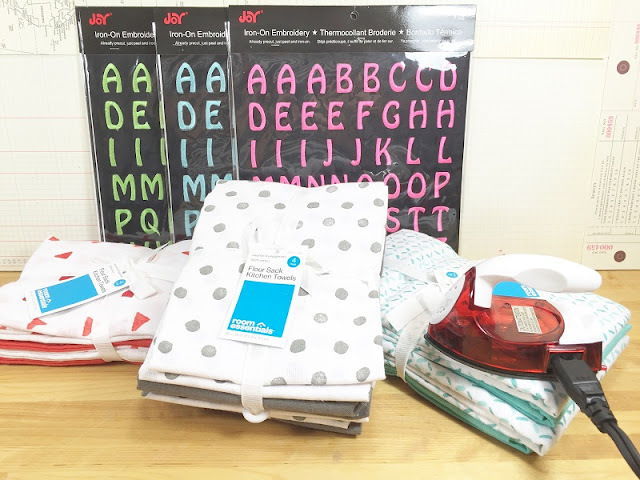 Not just for fabric, JOY letters can be used on a variety of surfaces. I love all the different ways you can use Joy embroidered letters. 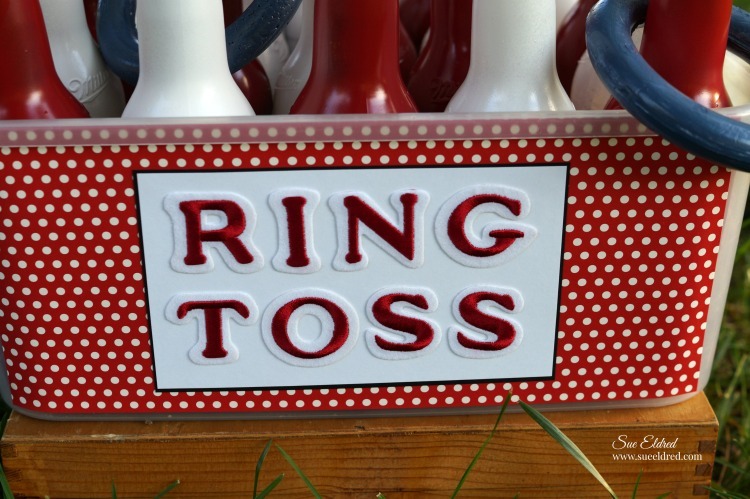 I was recently given the task to create a Ring Toss game for my grandson's carnival-themed birthday party. 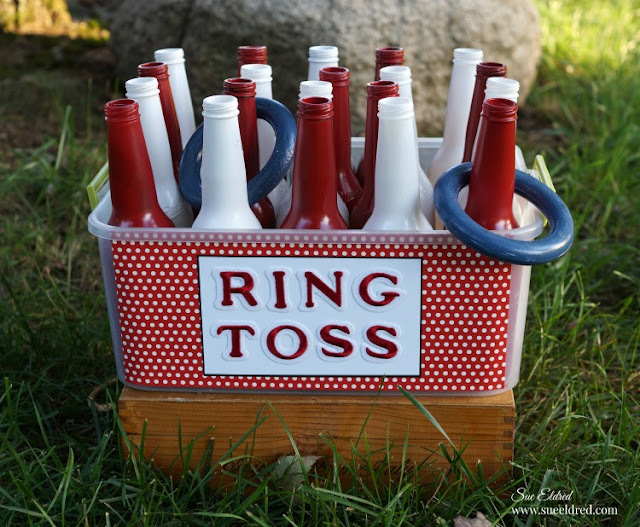 After washing and spray-painting all the bottles, I needed a cute sign for the game. Joy letters to the rescue - I just adhered them to the pretty paper I added to the outside of the plastic bin that holds the bottles. I love the look of succulents. 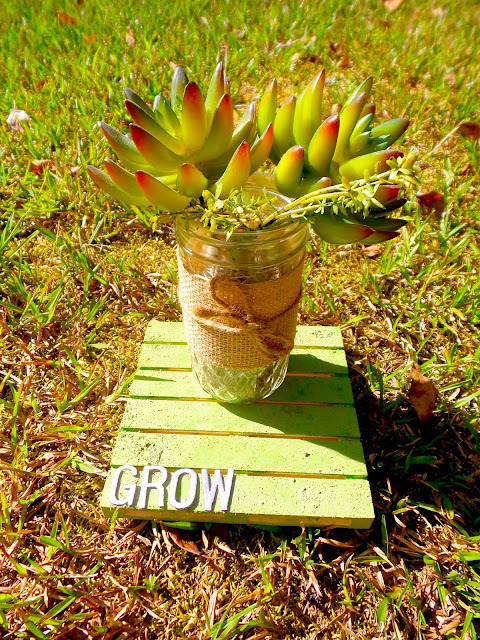 They are easy to take care of and they give a pretty pop of color to your surroundings. To show off my pretty plants, I wanted to give them a mini pallet platform that would also give them a little pep talk! I started with a mini wood pallet. You can find these at your local craft stores, usually for about $1 each. 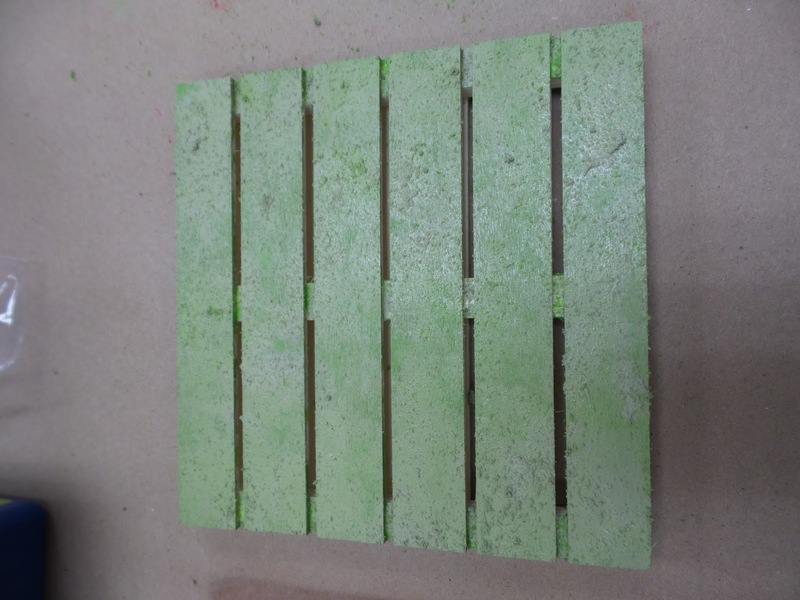 I painted the pallet with a textured paint to make it look like it's covered with moss. I glued on JOY embroidered letters to spell out "grow." Now my little plants have a cute place to sit while they drink in the sun! Create an easy fall harvest plaque with a tissue napkin collage and JOY letters. 1. Paint the canvas with an orange water wash. Paint the edges with undiluted, solid orange. 2. Cut the picture from the napkin and tear the edges. Ink the edges with the red stamp pad. 3. Follow the manufacturer's instructions to decoupage the napkin to the canvas, off to one side as shown. Seal the rest of the canvas with the medium. 4. Paint the Joy letters dark red. Let dry and glue to the canvas. 5. Pull threads from the edge of the burlap ribbon to fringe it. nk the edges with the red stamp pad. Glue the ribbon to the canvas along the edges. 6. Die-cut several leaves from papers. Fold the leaves to create veins and distress with inkpads as desired. Glue three leaves at the corner and the rest along the ribbon. 7. Make a bow with the hemp string and glue at the corner. 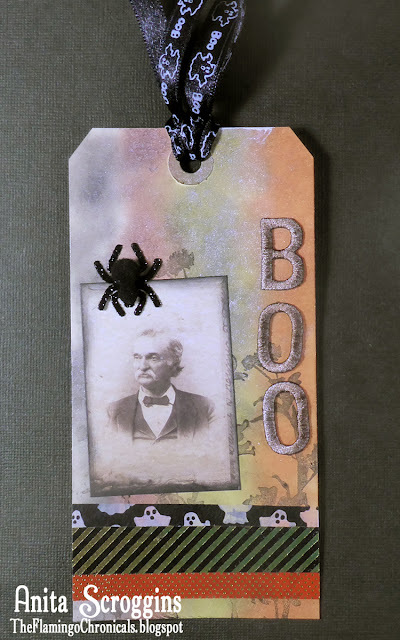 Do you like to give fun gifts for Halloween with cute personalized tags? I do! 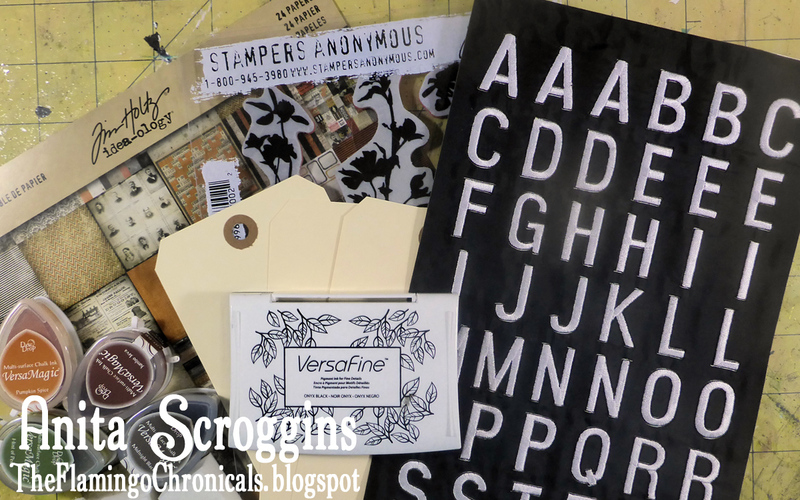 Adding a bit of whimsy to your tags with Joy Embroidered Letters is so much fun - and easy, too. 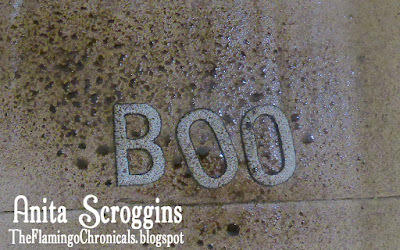 I had white letters, but I wanted something a little spookier for my tag. 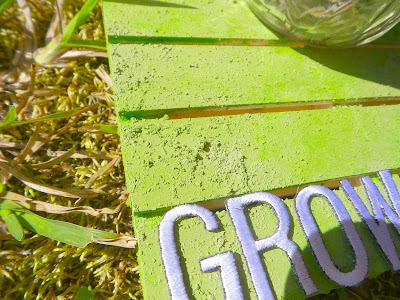 Changing colors is easy with spray ink - give the letters a quick spritz and set aside to dry. Look how great the letters look now! I inked my tag with multiple colors, stamped some background images, embellished the bottom with washi tape, then topped it with some iridescent spray ink. 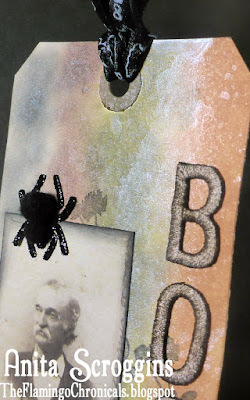 A bit of ribbon and a cute, furry spider finishes of my tag and it's ready to attach to a bag of Halloween treats. 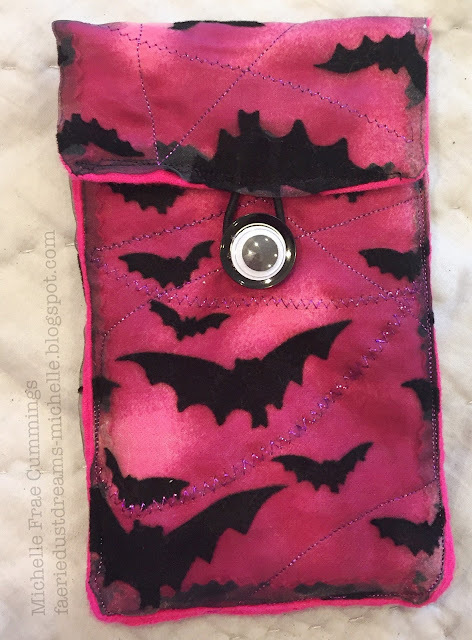 Even though my cell phone is in a protective case, I thought it would be fun to make up a decorative pouch for it! Now I can easily find it in my purse and it's wicked cool to show off! I just love Halloween, don't you? 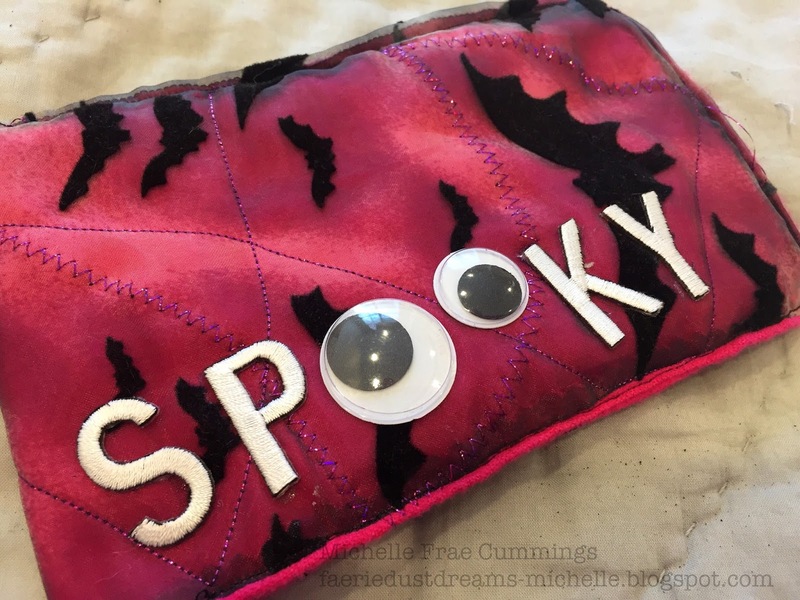 This stylish cell phone pouch can also be used to hold credit cards, money or keys for a quick jaunt into the grocery store. Trace your phone onto the translucent paper. 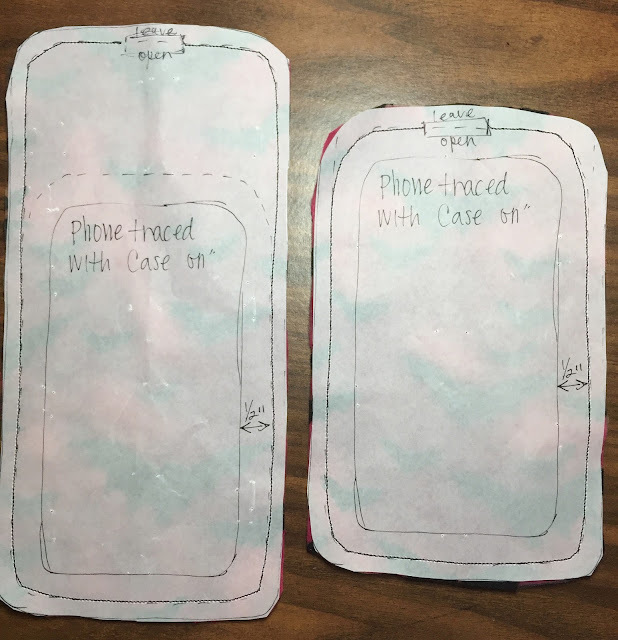 Use your ruler to measure a dotted border all around the trace (1/4" for a phone with no case or 1/2" for a phone with a case) for a seam allowance. Measure the length of your trace, then divide this by 3. Your result will tell you how much fabric to add for the flap of the pouch. 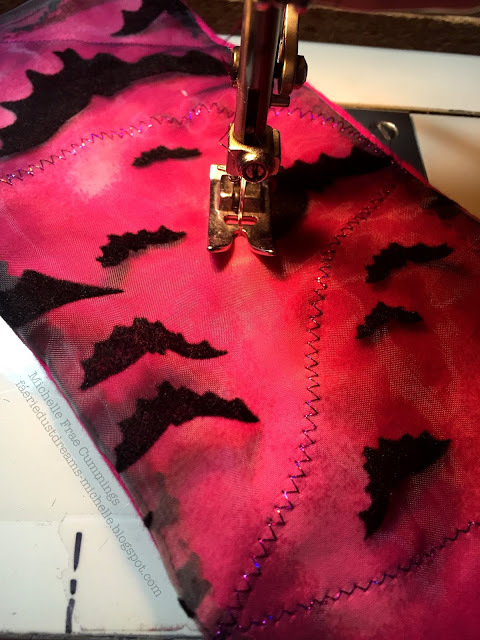 Add your seam allowance and mark a 1" slot to leave open at top of pattern as shown. Make two copies of your pattern and cut out both - one for the total length plus flap, the other for just the front. 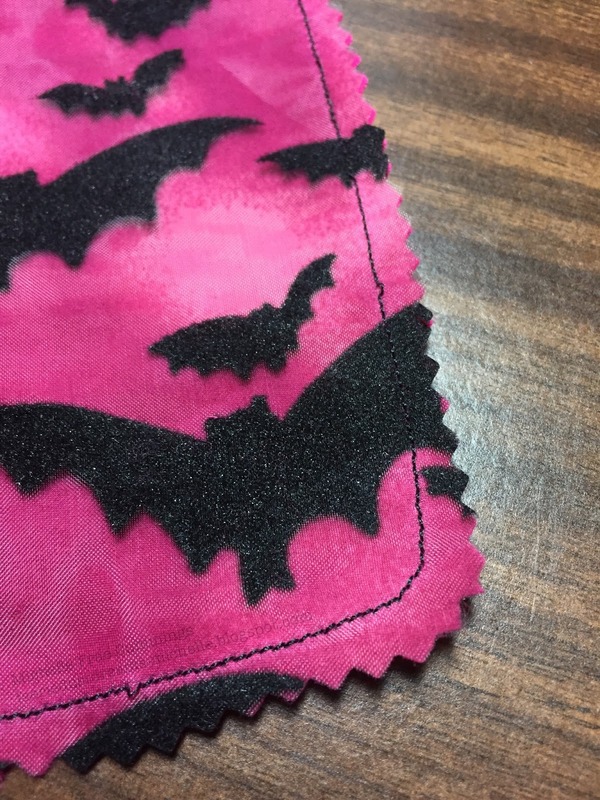 Lay the right side of the fabric on top of the fleece and pin your patterns in place. 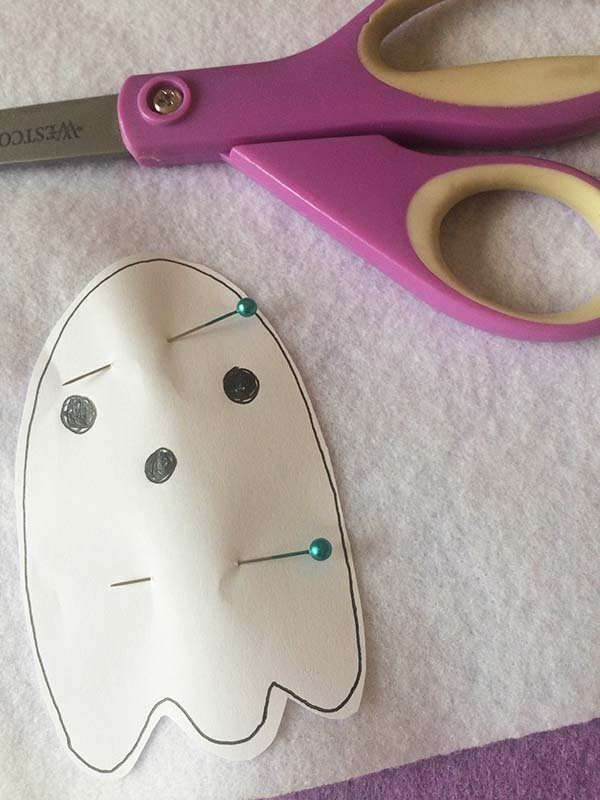 Sew along the dotted lines with a small stitch. Carefully remove the paper and trim edges with pinking shears. Use the slot openings to turn each piece inside out. Iron flat if desired. For the flap closure, pin the hair band just inside the slot of the longer piece, leaving a loop of it exposed and stitch the slot closed. Add any decorative stitching if desired on both pieces. 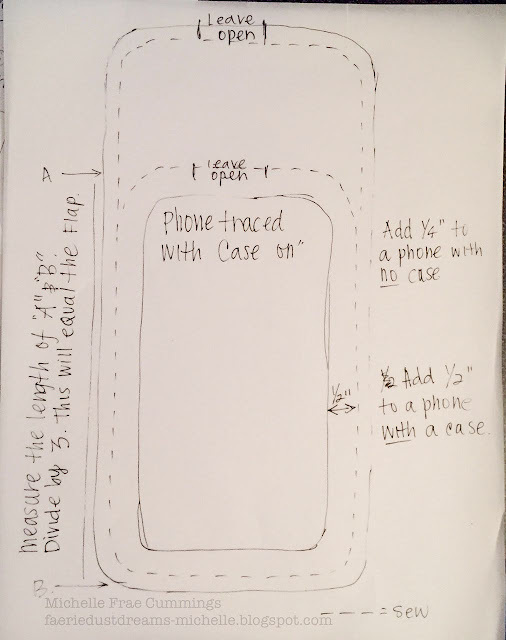 Pin your two pieces together and insert phone for fit. 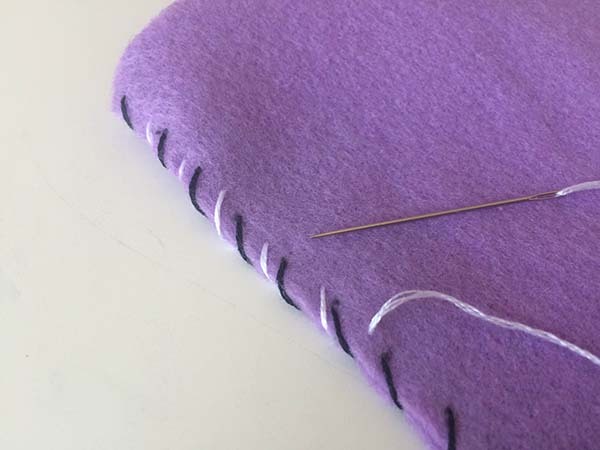 Pull down the flap to mark where the button should go for the loop closure and stitch the button in place. Stitch bottom and sides of the two pieces together to finish the pouch. 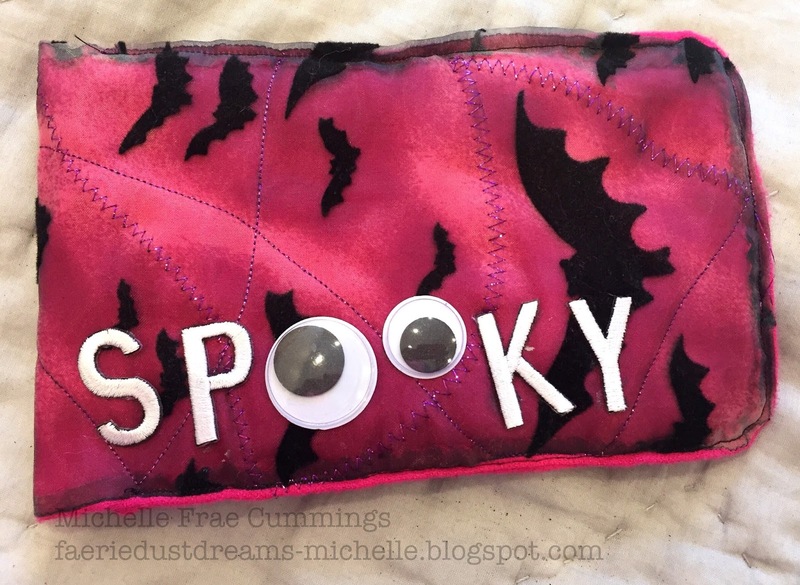 Glue a google eye to the button and glue the letters and extra google eyes to the front of the pouch. Allow to dry (I placed books on top to keep things flat until the glue was set). My fabric was organza, so I did not iron on the Joy letters like I would have if I was using cotton. Trick or Treat! Were you naughty or nice this year? 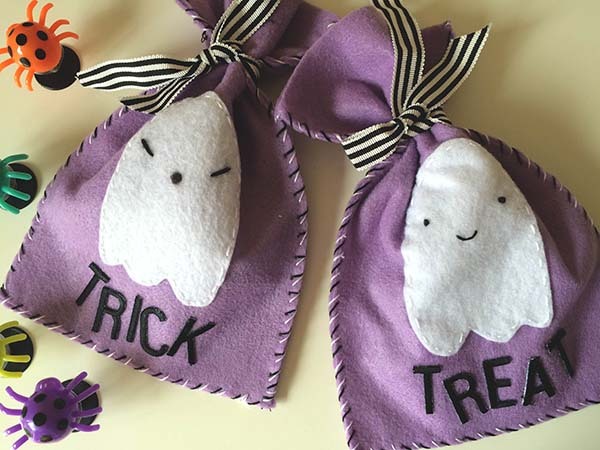 These cute party favor bags are perfect for a not-so-scary Halloween party. 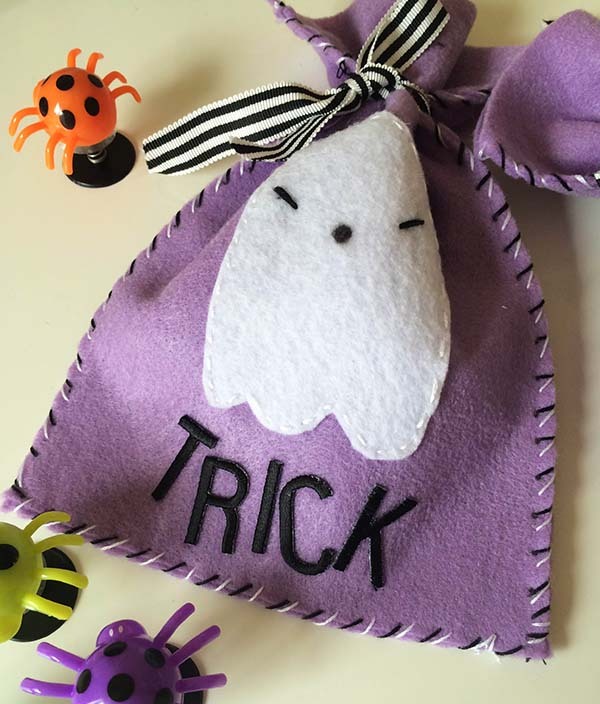 Fill the "TREAT" bags with candy and the "TRICK" bags with plastic spiders. Cut 2 pieces of felt measuring 5.5"x 9". 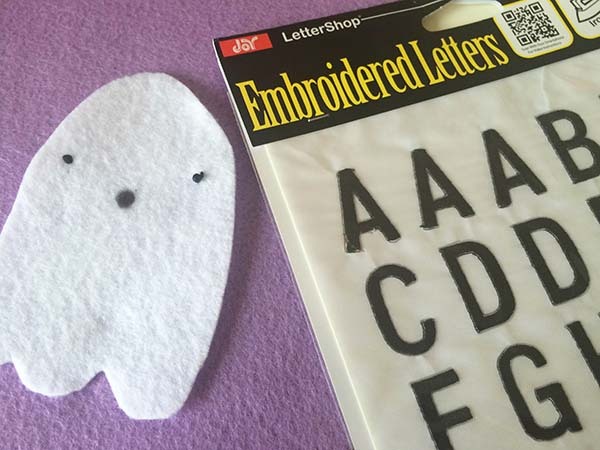 Cut a ghost shape out of white felt. Decide if your ghost is naughty (trick) or nice (treat) and stitch a happy (treat) or scary (trick) ghost face onto the shape. 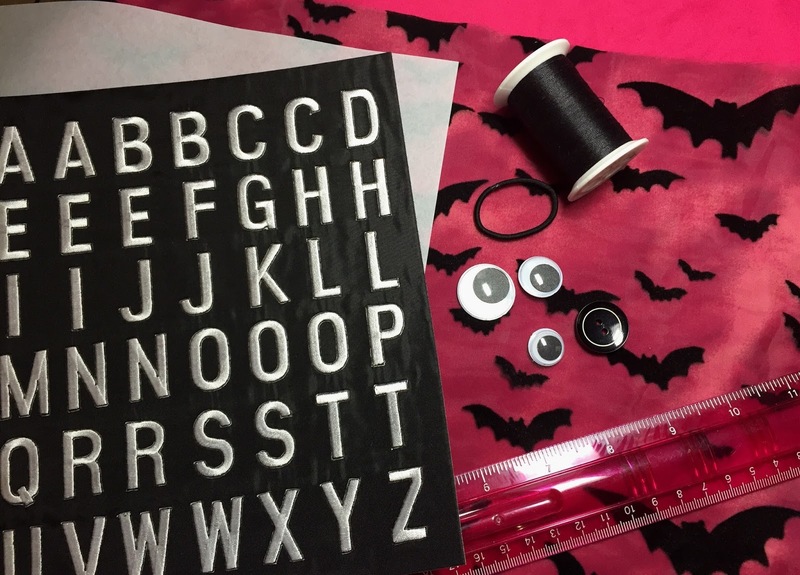 Iron the Joy Letters onto the felt to spell out TRICK or TREAT. Note: Felt can melt! 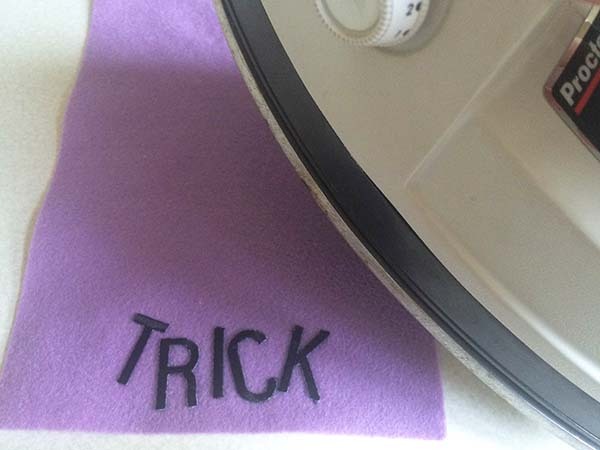 Set your iron at a low setting and use a pressing cloth over the letters when ironing them on to felt. If you don't want to iron the letters on, you can use fabric glue instead. 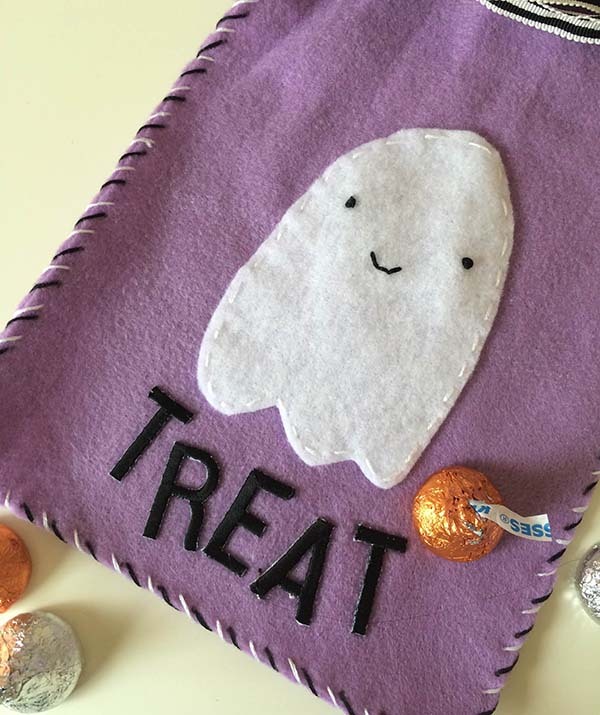 Once your letters are ironed-on, stitch your ghost onto the bag, then stitch the front and back sides of the bag together using a whip stitch. I got fancy and first stitched with black embroidery floss and then went back and stitched with white. Fill your favor bag with candy or spiders and tie closed with a ribbon. 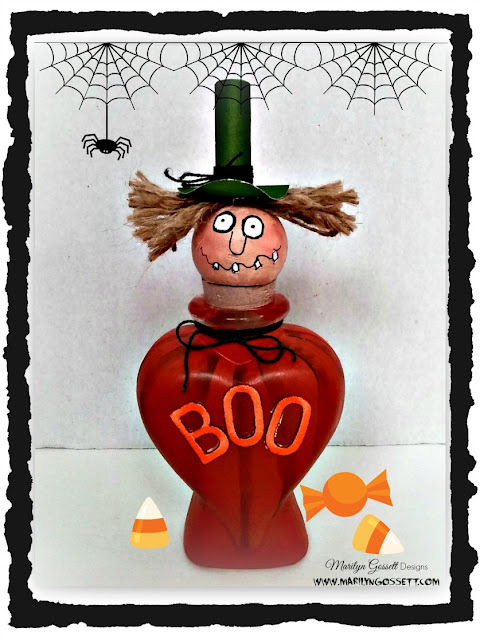 I hope you have a fun and safe Halloween! Come and visit me on my blog for more Halloween craft ideas. T'was the night before Halloween...and all through the house...there was a whole lot of stirring....but not by a mouse! We like to "Boo" our friends and neighbors anonymously with treats every year. Here is an inexpensive treat bottle that can be decorated and filled with candies for that special friend to enjoy and display. 1. For the head, cut a small rounded portion off the bottom of the Smoothfoam ball. 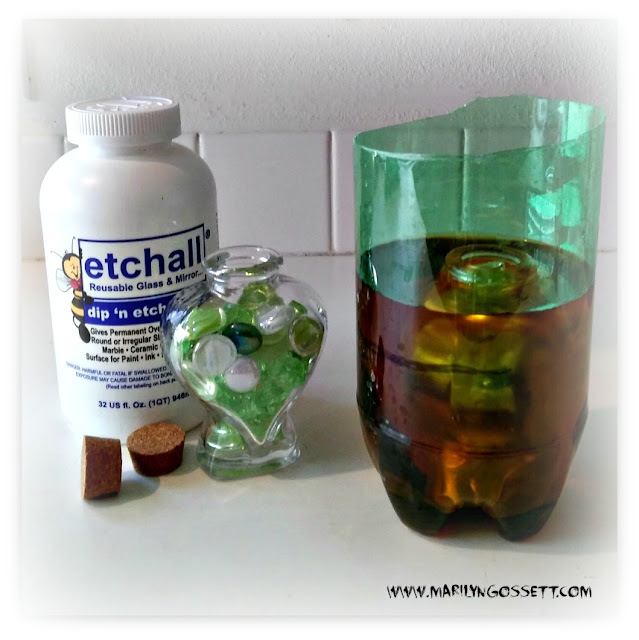 Glue the flat side to the top of the bottle cork and set aside to dry. 2. 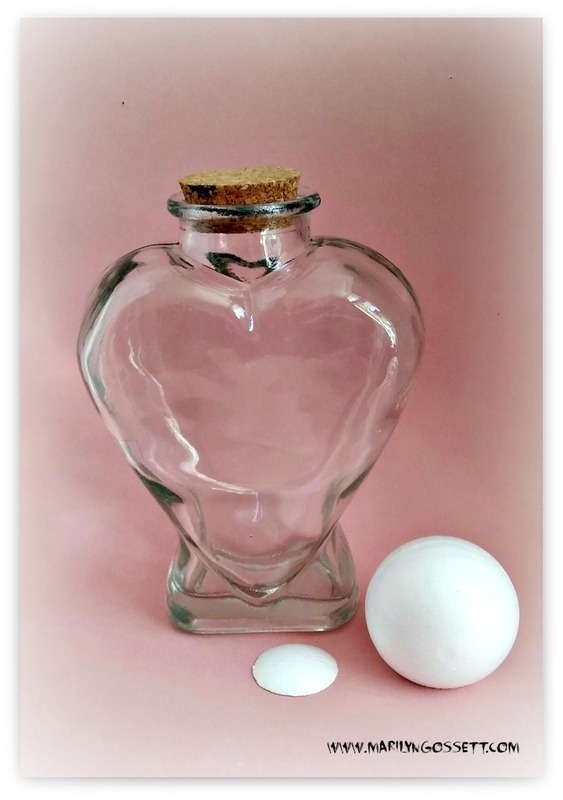 Follow the directions on the etching liquid packaging to frost the outside of the bottle and let dry. 3. Paint the ball head and cork beige and allow to dry. Refer to the photo and paint 2 small white circles for the eyes. When dry, paint a tiny black dip dot to the center of each eye. Then outline the eyes, draw the nose and the mouth with the marker. Draw the teeth and paint white. 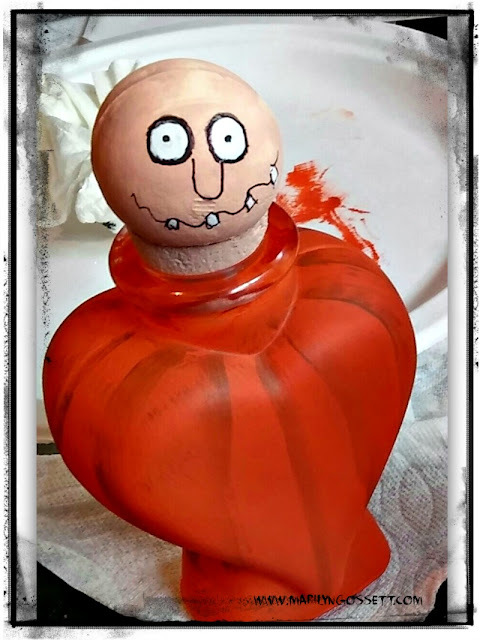 Paint the bottle orange, then when it's dry, paint some shading as shown in brown. 4. To make hair for the head, wrap jute twine around your hand about ten times. Slide it off your hand and cut the loops at each end. Tie an extra piece of twine around the middle and knot to secure. Glue to the top of the head. 5. To make his hat, Punch a 1-3/4" circle and a 1/2" circle, and cut a 1-1/2" x 3" strip from the green cardstock. Roll the strip into a cylinder and glue the small circle to the top and the large circle to the bottom. Glue the hat to the top of the hair. 6. Tie embroidery floss around the top of the hat. Tie another piece around the bottle neck and finish with a shoestring bow. Glue the letters to the front of the bottle.